By Kate Mcnair December 12, 2017 December 10, 2017 Advocacy, YALSA Info. 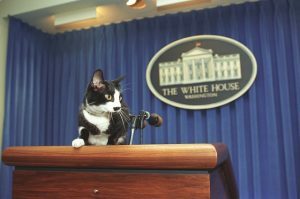 Couldn’t pass up a picture of a cat in the White House! To track progress on strategic goals, YALSA sends out an annual membership survey. This year, questions focused on how we practice advocacy at the local, state and national level. One of the goals of the organizational plan was “100% of YALSA members conduct advocacy at some level and recognize that they are doing so. Activities include but not limited to participating in local youth development boards and groups.” So in this year’s member survey we asked you what types of local and legislative library activities you have engaged in and if not, why not? We were pleased and surprised by the results. The great news is that out of members who filled out the survey, 80% practiced local advocacy and 62% practiced legislative advocacy in the last year. With an incoming administration in the White House, ALA and YALSA called on members to share information about the impact of libraries and library funding in the lives of teens. And thanks to those 62% of members who engaged in legislative advocacy in the last year, we kept IMLS funds in the the federal budget. The newly updated YALSA Advocacy Toolkit with a great section on legislative advocacy. We appreciate everyone who took the time to answer the member survey as we work to measure our progress toward the goals outlined in the organizational plan.